ALBANY – The belief that Albany was going to be politically transformed when the state government became all Democratic-run was quickly established when the takeover became official in January. New abortion protections, tougher gun control laws, college aid for undocumented immigrants, expanded rights for transgender New Yorkers and new legal avenues for victims of child sexual abuse were among the long-stalled items to pass. The first and most important fiscal test of this new Democratic hegemony has been met with the recent passage of a new, $175.5 billion state budget. A key question lingers, however, in the budget deliberations' aftermath: Is upstate a loser or a winner? Democrats say they carved new priorities into the budget – “advancing New York values” is how they termed it – with an emphasis on transportation infrastructure improvements, a ban on plastic bags, big environmental spending, new protections for criminal defendants and codifying the federal Affordable Care Act, known as Obamacare, into state law. Democrats say that in the face of budgetary strains brought on by declining income tax revenues they still were able to create a school aid pot that grows faster than inflation and restored a number of health care cuts that were on the table at one point. But Republicans, now firmly in the minority in both houses, portray a different new fiscal plan – one that shows Democrats were eager to grab the spoils that came with their political victories last fall. Upstate, they say, takes the hit. A tale of two states – again? It is a budget, the GOP says, with a New York City-centric tilt, from a big percentage hike for the city’s public school system compared with many other districts while not increasing funding for road and bridge repairs upstate and cutting upstate programs affecting everything from agricultural research efforts to veterans services programs. Republicans say school aid increases were smaller in their suburban and rural districts compared with what many Democratic lawmakers were able to bring home. “Those constituents who benefit from those programs are Democrats and Republicans and independents. They shouldn’t have to pay a price from someone who wants to extract a political price in the budget," said Sen. Rob Ortt, a North Tonawanda Republican. 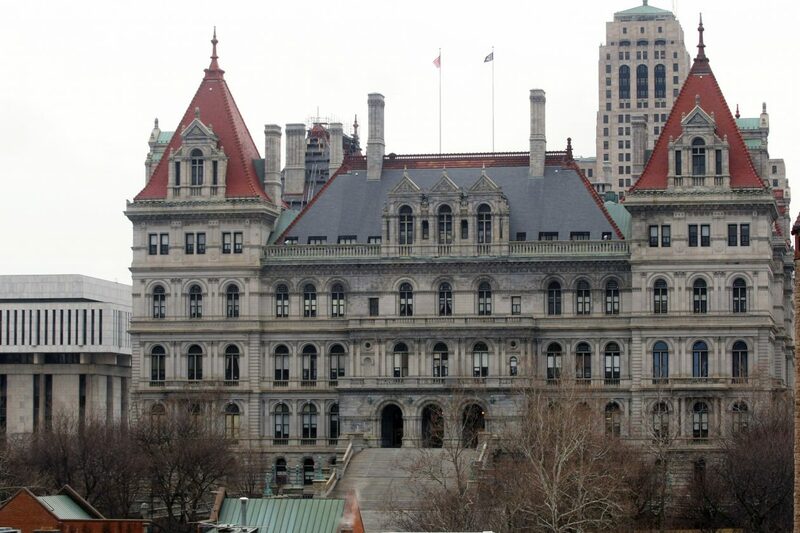 “We actually invested more in upstate New York than our Republican colleagues had," said Sen. Liz Krueger, a Manhattan Democrat and chairwoman of the powerful Senate Finance Committee. Krueger accused Republicans of cherry-picking items in the new budget to re-play their “classic stereotype” that New York City benefits at the expense of other regions. “Frankly, it’s never been true and it’s not true now that we are in power," she said. The state budget is intentionally made to be too complex for most to understand. But one mathematical equation is simple: There is a fraction of lawmakers from upstate in the majority party in the state Senate than compared with the same time a year ago. A year ago, 19 Republican senators from upstate areas were in the majority – putting them in the front seat, with Assembly Democrats and Gov. Andrew M. Cuomo, when it came to budget decisions. When the GOP was ousted from Senate control, three Senate Democrats from that same region are in the majority party, with the majority of the 39-member Democratic conference hailing from New York City or its adjoining suburban counties. Republicans say that new math played out in the budget. Consider Foundation Aid, the category of state aid to 700 school districts that helps fund school operating costs. In the new budget adopted April 1, it rose $618 million, or 3.5 percent. That was the same dollar amount increase as the previous year. But Republicans say Democrats unfairly treated districts in suburban and rural areas represented by GOP lawmakers. In Erie County, where most suburban districts are represented by GOP senators, the Foundation Aid number rose 2.8 percent. Much of that was driven by Buffalo, which saw a 3.6 percent bump in that pot. Many suburban districts in Erie County represented by GOP senators, though, got Foundation Aid increases in far lesser amounts; in a number of cases, the aid rose less than 1 percent. One district did well with that aid category: Lackawanna. It is represented in Albany by Sen. Tim Kennedy and Assemblyman Sean Ryan, both Democrats from Buffalo. Four of the school districts represented by Sen. Chris Jacobs, a Buffalo Republican, were in that under 1 percent category. “This after months of proclamations and promises of dramatic increases from the new majority," Jacobs said. Districts in Westchester County – home to the new Senate Majority Leader, Andrea Stewart-Cousins, and Senate Education Chairwoman Shelley Mayer – saw a 5.2 percent Foundation Aid increase. New York City schools? Up 4.4 percent. Last year, suburban school districts in Erie County received an extra $10.9 million in Foundation Aid, according to Sen. Michael Ranzenhofer, an Amherst Republican. This year they got a $7.3 million hike. “New York City’s gain was our residents’ loss," said Ranzenhofer, adding that local districts will have to cut planned spending or seek higher local property tax levels. Democrats counter that the all-Democratic Albany has shifted priorities on a number of fronts, especially areas they say Republicans long neglected. Poorer, urban schools did do better under the Democrats in the new budget because, they say, the needs are greater. Moreover, they say the overall school funding pot – beyond just the main Foundation Aid – will rise by $1 billion, or 3.8 percent, and help all regions of the state. “The funding went to communities that needed it most," Kennedy said, adding that making the property tax cap permanent in law will have an especially important impact for upstate residents over the coming years. The budget identifies revenue sources – eventually worth $25 billion – for New York City subway and suburban rail infrastructure improvements because, they say, the systems have been long-neglected. The Niagara Frontier Transportation Authority has gotten a promise of $106 million in new capital money from the state to devote to its deteriorating light rail system. The NFTA, and other upstate transit agencies, will get a new funding stream for operating expenses courtesy of a new sales tax on upstate auto rentals. Kennedy said that funding will be “transformative” to improve light rail and bus service across the region in Democratic and Republican districts. Kennedy acknowledged added funding getting steered to Buffalo, for programs such as community schools, but said suburban and rural areas represented by Republicans also get funding to help with transportation services for people to get to medical appointments, in-home services for the elderly, child care funding and added money for connecting opioid addicts with treatment. Democrats also say they wish the budget did offer more. “I will say that, for me, being the majority leader at a time with a multiple billion deficit, it’s not a great feeling," said Assembly Majority Leader Crystal Peoples-Stokes, a Buffalo Democrat. “I’d rather be majority leader at a time with a surplus so there was more to share." Having said that, she added, it’s to be expected that Republicans now out of power will complain about a budget they had no control over. “The process decided there should be less Republicans in leadership and that there should be more Democrats. Complain about that all day long, but that’s the process," she said. In Buffalo last week, Cuomo spent 30 minutes in a speech going through all the various spending initiatives in the budget for Western New York. Some of the spending is new, some old. He talked of money for cultural groups, which are regular recipients of state aid each year, as well as funding for development on the East Side of Buffalo and money to consider options for Buffalo’s Skyway. “This is the most aggressive plan we’ve ever done for Buffalo," Cuomo said as part of a post-budget victory tour he takes each spring. But Republicans say Democrats are glossing over cuts to various upstate-centered programs. Ortt, the GOP senator, said the new budget eliminates or reduces 18 agriculture-related programs, affecting everything from agricultural research to veterinarian diagnostic animal healthcare and a rabies program. Ortt said the budget also trims a number of veterans-related programs in upstate, including those providing various mental health, suicide-prevention and jobs-related services. Hardest hit, he said, is a veterans program for the Finger Lakes region. Gallivan said the new budget will force localities to turn to property taxpayers for a greater share of road and bridge repairs, and programs he got funded in the past – from an alternatives to incarceration initiative to local domestic violence agencies – will be cut. Republicans slammed an expanded sales tax effort affecting online consumers using sites like eBay; only a part of the revenues collected will go to counties and most of it – estimated at $320 million a year – will go to help fund downstate subway and train improvements. The budget is also silent, GOP senators say, on a $65 million program designed to help localities fix crumbling roads after extreme weather, such as this year’s winter that saw much freezing and thawing conditions that have affected roads across the state. Senate Democrats relish the irony of complaints coming from Senate Republicans – who for decades were the ones making closed-door decisions that benefited their districts over Democratic lawmakers in the chamber. Senate Democrats say they also restored funding proposed to be cut for cities, towns and villages across the state. They note upstate’s decline over the decades came during Senate GOP control. “We understand we are one New York," Murphy said. The head of one upstate group, whose members include several Buffalo business organizations, praised Senate Democrats for passing a bill in January to make the state’s property tax cap program permanent in statute – and then for ensuring with Cuomo that it was part of the final budget deal. “We certainly appreciate that," said Michael Kracker, executive director of Unshackle Upstate. Not appreciated, though, was passage of two major tax and fee hikes that the group has, until now, blocked for years. One will boost taxes by $128 million on employers who purchase energy through energy service companies. “Businesses upstate will be paying significantly more for energy costs," Kracker said. Also, he said, right-of-way fees – expected to total $200 million – can be now be levied by the state on telecommunication companies looking to put fiber optic cables on state land. Besides hiking business costs, Unshackle Upstate fears it will put a chilling effect on broadband expansion in under-served upstate. When Republicans controlled the Senate, capital funding for New York City’s Metropolitan Transportation Authority was often linked to upstate transportation needs. “No doubt this budget put a significant effort on the MTA. I don’t think we heard enough about upstate infrastructure needs," Kracker said. • School Districts in Westchester County – home to the new Senate Majority Leader, Andrea Stewart-Cousins, and Senate Education Chairwoman Shelley Mayer – which saw a 5.2 percent Foundation Aid increase. New York City schools saw a 4.4 percent increase. • The Niagara Frontier Transportation Authority expects to get $106 million in new capital money from the state to devote to its deteriorating light rail system. • New York City’s subway and suburban rail infrastructure which stands to gain $25 billion from revenue sources. • 18 different agriculture-related programs, affecting everything from agricultural research to veterinarian diagnostic animal healthcare and a rabies program. • Employers who purchase energy through energy service companies. A $128 million tax will be levied on them. • Consumers who use online retail sites, whose purchases will be subject to a new tax.